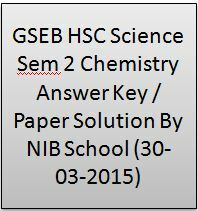 GSEB HSC Science Sem 2 Chemistry Answer Key / Paper Solution By NIB School : Gujarat Secondary and Higher Secondary Education Board HSC Science Semester 2 Exam was Started Today. Answer Key of Semester 2 will be updated day to day on its official website www.nibschool.com/Test.html. Candidates can download Chemistry Paper Solution form click on below link.